Hawaiian Airlines says it aims to be competitive on prices. Hawaii promises paradise to vacationers. Getting there? That’s far from blissful. But Hawaiian Airlines is about to make that difficult slog — often lasting 15 hours or more — much easier for New Englanders. The company on Friday plans to unveil a roughly 10-hour nonstop flight covering nearly 5,100 miles from Boston to Honolulu. Billed as the longest domestic fight in US history, the five-day-a-week service will connect Logan International Airport with Honolulu’s Daniel K. Inouye International Airport. The flights are scheduled to begin on April 4, on 278-seat Airbus A330 jets. How does Hawaiian know it will have one for the record books? Because it is the current record-holder, with the New York-Honolulu route it launched in 2012. The success of the New York route has emboldened the company to double down on the East Coast, by launching nonstop flights from Boston. Referring to the New York launch, “That was the time we got serious about expanding into the eastern part of the US,” said the airline’s CEO, Peter Ingram. 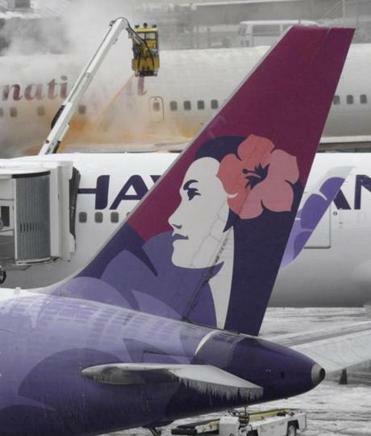 The Boston metro area is the largest US market without nonstop service to Hawaii, the company said, even though nearly 500 people fly between Logan and Hawaii on a typical day. Travelers have at least one stop, which means the trip can take from 13 to 20 hours. Many people break up the trip with an overnight stay, often in Los Angeles. Thomas Glynn, the Massachusetts Port Authority’s chief executive, said the new flights will make it easier to travel to Hawaii for just a week. Today, many New Englanders need to plan on two days of travel to get to the islands, and another two days to return home, he said. The flights will depart from Logan’s Terminal E, which is primarily used by international airlines. Glynn said that Hawaiian wanted to use Terminal C, home to its business partner, JetBlue, but there wasn’t enough room. Hawaiian is offering promotional round-trip fares for $617 in the main cabin and $1,776 for first-class, which features “lie-flat” leather seats. Those prices would be guaranteed only for travel next April, with some exceptions during the month. Current prices on other airlines for that time of year start in the $800 range and are not for nonstop flights. Ingram said Hawaiian will strive to be competitive and probably will not charge much above the existing fares on other airlines, even though it is the only one offering nonstop service from Boston. That’s partly because relatively few business travelers are expected to make the trip, compared to vacationers. Correction: An earlier version of this story misstated the date of the inaugural flight.